This is Jon. The day after Adelyn's birthday celebration we headed to Omak to take in the world famous Omak Stampede and Suicide Race. Omak has been on my bucket list of rodeos to see and I can check it off, although I'm pretty sure it won't be a "one-and-done" trip. Very fun. 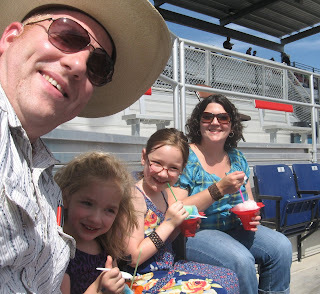 A few years ago the rodeo underwent some major capital improvements to increase the fan-friendliness of the rodeo. The old stands were torn out and a new covered arena on both sides that wraps around the arena floor were put in. Great views, intimate setting. Yeah, I said it. Rodeo coverage is what I do and I said intimate. It was about 145 degrees outside. I really liked it, but of course I was wearing my hat and sunglasses with SPF 500 on my skin. The girls thought differently and chilled out in the shade for a bit. Delaney loves to wear my hat. I love to see her in my hat. Don't worry about Adelyn's tounge. She had just finished her grape snow cone. This is Jon. More pics from Addy's birthday. 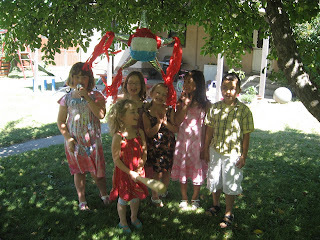 We didn't take many photos as we were trying to corral kids, feed 'em and keep 'em from getting too crazy. The nice thing about Adelyn's birthday is August in KTown is always so nice, so much of the day was spent outside. Adelyn wanted a pinata. Here the kids were getting ready for what turned out to be a little bit of violence! Kayla, Delaney, Kenzie, Baneley, Al and Adelyn. The kids all live within a few houses of each other. Makes it easy for them to travel around the block without having to go far. Brittany got into the mix. The pictures are a bit out of order, because she didn't go first, I promise. Adelyn had some good form here. The girlfriends. Al didn't make this photo. He felt a little out of place only because he was the lone representative from the male gender. We hung out a bit, representing well. This is Jon. We celebrated Adelyn's 4th birthday party over the course of a few days. Parents party, grandparents party and kids party. She was very spoiled. Can't believe this girl is four! 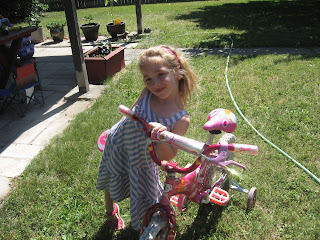 Addy Bear with her new Barbie Bike. She looks like she's ready to hit the town in her new outfit. A big boost in her piggy bank! My two girls lookin' cute. I think she looks adorable in these two pics!